When I was first introduced to courtship as a young teen, it felt like it was a continuation of the True Love Waits message of my Southern Baptist youth group. It didn’t seem weird that courtship speakers were telling teenage girls to pledge their virginities to their fathers until their fathers gave it over to their future husbands, sealed with a ring or a heart and key locket, because True Love Waits already had tens of thousands of evangelical teens signing purity pledges and wearing purity rings. If courtship advocates had stated up front in the introduction that they believed in young courtship and were OK with child marriage, my family and many others would not have gotten on board. Instead, courtship was presented as an extension of the early-1990s abstinence movement and a way to ensure that teens would be able to keep the pledges they made. The abstinence pledges, rallies and True Love Waits jewelry all helped normalize parental control over their children’s sexualities and the idea that teenagers’ bodies did not belong to us but to our parents. More broadly, the complementarian theology of male headship and female submission taught in much of the evangelical world helped prime the pump for courtship culture. Mainstream evangelical churches that teach wives to submit to their husbands promote an inherently unequal relationship power dynamic as not just OK, but the one godly, biblical way for men and women to relate in marriage. Complementarianism presents a vision for relationships where women lack full autonomy. In the days since I wrote an oped for the Los Angeles Times on evangelical courtship culture and Roy Moore, I’ve heard objections that young courtship and child marriage is not practiced by all evangelicals. That is something I will readily admit. However, the teachings about women, sexuality and relationships in broader evangelical culture have contributed to the normalization of courtship culture. Furthermore, the continued association of evangelical and religious right leadership with men who defend child marriage enables those abuses to continue. That’s the logic behind “Duck Dynasty” star Phil Robertson’s argument for child marriage, and it’s what pastor and home-school leader Kevin Swanson stated explicitly in his defense of Robertson. As much as some would like to characterize Swanson as a fringe figure, World magazine accepts his advertisements, and his “Freedom 2015” National Religious Liberties Conference counted Republican presidential candidates Ted Cruz, Bobby Jindal, and Mike Huckabee among its speakers. While it is unlikely that men like Huckabee, Jindal and Cruz would defend early courtship and child marriage themselves (although Huckabee did come to Josh Duggar’s defense when the story of Duggar molesting his younger sisters came to light), as long as powerful politicians continue to associate with young courtship and child marriage advocates like Swanson, it helps normalize and mainstream those advocates. Mike Huckabee, incidentally, is also closely associated with now-disgraced alleged sexual predator Bill Gothard and Gothard’s Institute in Basic Life Principles. Gothard, who himself promoted courtship through IBLP and IBLP’s home-school arm, Advanced Training Institute, is currently facing lawsuits after multiple women came forward through the website Recovering Grace to allege a pattern of grooming and sexual abuse by Gothard while they were in their teens. They also alleged mishandling of abuse cases by IBLP leadership. As of this writing, Huckabee’s endorsement of IBLP’s prison ministry remains on IBLP’s website. Similarly, in the evangelical world, popular Reformed website The Gospel Coalition, which was co-founded by Presbyterian Church in America luminary Tim Keller, and counts such evangelical notables as John Piper, Ligon Duncan, Albert Mohler, Russell Moore, and David Platt as members of its council, has frequently promoted courtship and stay-at-home daughter advocate Voddie Baucham (his own daughter was an adult when she married, but the stay-at-home daughter movement he promoted has helped normalize young courtship). As troubling stories about conservative Reformed theologian Doug Wilson’s handling of sexual abuse in his congregation emerged, TGC remained silent despite their frequent promotion and praise of Wilson’s work. They also kept quiet about the mishandling of sexual abuse within Sovereign Grace Ministries despite founder C.J. Mahaney’s affiliation with TGC. Instead, when people asked TGC to respond, they went on a Twitter blocking spree. While I am sure that the evangelical leaders mentioned here would be opposed to young courtship and child marriage, the fact remains that they continue to associate themselves with men who do support those practices. 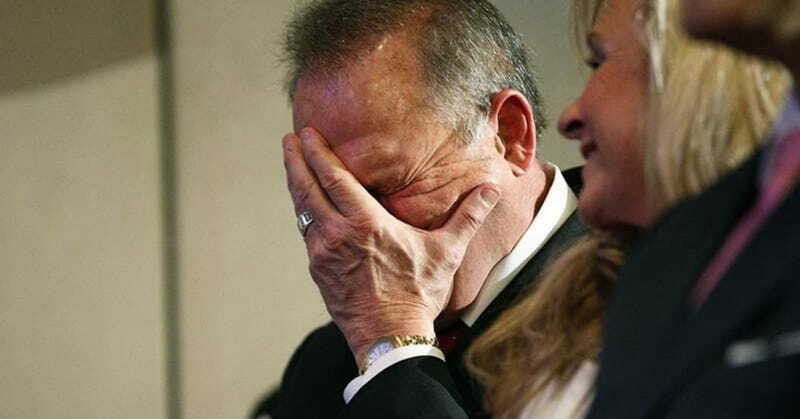 Their condemnations of Roy Moore and insistence that evangelicalism does not support adult men pursuing teen girls rings hollow as long as men such as Kevin Swanson, Doug Wilson, and Voddie Baucham are accepted in their midst. Kathryn Brightbill is legislative policy analyst at the Coalition for Responsible Home Education, a nonprofit advocating for the interests of home-schooled children. The views expressed in this opinion piece do not necessarily reflect those of Religion News Service. Photo: Former Alabama Chief Justice and U.S. Senate candidate Roy Moore waits to speak at a press conference, Thursday, Nov. 16, 2017, in Birmingham, Ala.